- The TSB for 1999 Toyota Corolla suggests replacing the ECM with an updated part as a repair for the diagnostic trouble code P0446. In some GM cars, a bad fuel tank pressure sensor also could cause the code P0446. During the leak test, the ECM seals off the EVAP system by closing both, the vent control valve and the purge control valve (solenoid). Once the EVAP system is sealed, the ECM monitors the vacuum or pressure in the EVAP system. If the EVAP system doesn't hold the vacuum or pressure, the ECM recognizes an EVAP leak. Q: 2002 Mercedes-Benz E320, what could cause the code P0446? 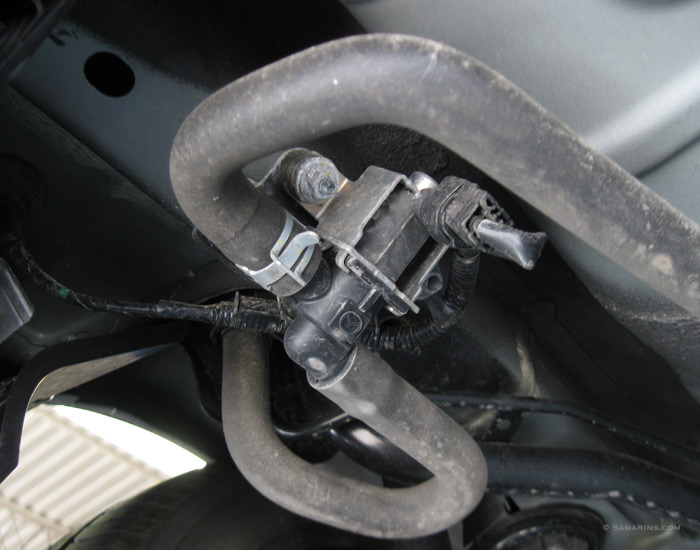 A: The vent control valve or as it might be called canister shut-off valve goes bad quite often in these cars. You might want to start with having it tested. Q: 2005 Chevrolet Cobalt was parked outside for seven months. It started OK, but after one-hour drive the Check Engine light came on. I had it scanned at Autozone; the code was P0446. What could cause it? A: If the car was parked for a long time, it's not unusual that some insects make a nest in the vent filter of vent hose, essentially blocking it; this could cause the code. Another thing, the vent control valve could go bad or a wiring or connector could get corroded.